Fender skirts, known in Australia and the United Kingdom as spats, are pieces of bodywork on the fender that cover the upper portions of the rear tires of an automobile. Fender skirts are implemented for both aesthetic and aerodynamic reasons. Rather than air flowing into and being trapped in the rear wheel well, it flows smoothly over the bodywork. They are generally detachable to allow for tire changes and installation of snow chains. 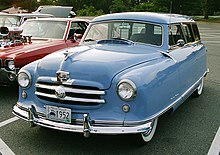 Automakers have also experimented with front wheel fender skirts, as on the 1950–1954 Nash Rambler, but with success limited by the fact that the front wheels must pivot for steering, extending out from the side of the vehicle slightly. In GM parts accessories books, fender skirts are known as fender shields. First described as "pants", they were used for the streamlining effect by Frank Lockhart on a 1928 Stutz land speed record attempt car. Factory production of fender skirts began with the 1932 Graham-Paige. Aesthetically streamlined designs were copied to mass-produced models. The innovations introduced by Amos Northup, such as the V'd radiators, fender skirts, and sloping beaver-tails, became common after 1933. However, by the 1970s, fender skirts began to disappear from mass market automobiles. Fender skirts remained for some time longer on a few cars, particularly large American luxury cars. Fender skirts were often paired with whitewall tires. The extent of the skirt also varied, before the 1950s it was common for all but the very bottom of the rear tire to be covered, while by the 1960s fender skirts only covered some of the top of the tire, and were largely absent on cars other than top line models. For example, up until 1976, the Chevrolet Caprice, Oldsmobile 98, Buick Electra, Pontiac Bonneville and the Cadillac Fleetwood, DeVille and Calais models used fender skirts. The Cadillac Eldorado models sported fender skirts from 1971 thru 1974. Starting in 1977 only the Pontiac Bonneville retained the use of fender skirts on General Motors downsized cars. In 1980 the Oldsmobile returned the fender skirts to the 98 model. By 1985 fender skirts would disappear from all standard General Motors cars. In 1989, fender skirts were used again on the Cadillac front wheel drive Fleetwood models until 1993. In 1993, Cadillac again incorporated fender skirts into the design of the re-styled rear drive Fleetwood, this design would last until 1996. The General Motors EV1 had fender skirts later. In European automobile design, Citroën notably used fender skirts on nearly all models produced between 1950 and 1990, most prominently in the DS, 2CV, Ami, GS, SM, BX and CX. As of 2015, the last mass-produced car with fender skirts was the 1999-2006 Honda Insight, although they are available for some new cars as aftermarket accessories (the Chrysler PT Cruiser, Volkswagen Beetle and Volkswagen Karmann Ghia being some examples). Some cities, such as Los Angeles, have fender skirts on municipal buses for safety purposes, as they can prevent items in the road from slipping under the tires. In 2013, the limited production Volkswagen XL1 reintroduced fender skirts on modern cars. ^ Schultz, Mort (October 1985). "Body/Chassis: a Century of Progress". Popular Mechanics: 59. ^ Berger, Michael L. (2001). The automobile in American history and culture: A Reference Guide. Greenwood Publishing Group. p. 417. ISBN 978-0-313-24558-9. ^ a b Gartman, David (1994). Auto Opium: A Social History of American Automobile Design. Taylor & Francis. pp. 118–121. ISBN 978-0-415-10572-9. Wikimedia Commons has media related to Fender skirts / spats. This page was last edited on 7 October 2018, at 21:02 (UTC).